Heavy duty, all welded, 14 gauge steel construction. Frame is 1-1/2 x 1/8" angle iron for added strength. Rolls smoothly on 5" polyurethane bolt-on casters, (2) swivel with side brakes and (2) rigid. 1200 lbs. capacity. Pegboard holes are 1/4" diameter and punched on 1" centers. They accommodate standard peg hooks. (peg hooks are not included.) 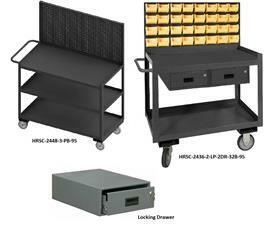 Louvered panels accommodate Hook-On-Bins®. 32 Hook-On-Bins® are included. Bin size is 4" x 7" x 3". Locking drawers, include locks and 2 keys. FOB Shipping Point. 14-25/32 x 19-19/32 x 6-11/32"
36 x 24 x 65"36 24 65"